We bring you a sneak peek at 2K Games new gangster epic Mafia II – feel the thrill of clawing your up the legions of an organised crime world starting out in 1940’s America. 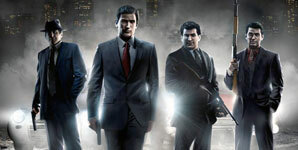 Mafia II will be available to buy on Sony PlayStation3 and Microsoft Xbox 360 on August 27, 2010. Mafia II will have an ESRB Rating of M for Mature due to violence and adult themes contained within the game. From the developers of the award-winning Mafia comes Mafia II, a beautifully crafted look into the dark and unforgiving world of the Mafia where clothing, cars, music and advertising are meticulously created to replicate an American city in the â40s and â50s. Players will easily become engaged in the gameâs cinematic, Hollywood-style experience with strong, believable characters in a living, breathing city that transports them to a time when rock-n-roll first strummed its guitar and chrome-plated hot rods roared down boulevards. Powered by 2K Czechâs next-generation Illusion Engine built specifically for Mafia II, players will experience the true evolution of the game. Gunfights, hand-to-hand combat and vehicular exploration feature new depth and dimension that allow players to experience the world of Mafia II in a way that will keep them coming back for more. A petty criminal his whole life, Vito, along with his childhood friend, Joe, will descend into the world of organized crime. Together, they will work to prove themselves to the Mafia as they try to make their names on the streets. Starting with low-level jobs like robbery and stealing cars, Vito and Joe escalate quickly up the Mafia family ladderâ¦but the life as a wise guy isnât quite as glamorous as it seems. Action-Packed Gameplay: Take part in heart-stopping car-to-car chases, visceral hand-to-hand combat and intense gunplay, all of which come together to form a deep and engrossing gameplay experience. Immersive World and Period: Enter the world of Empire CityâWorld War II is raging in Europe and the architecture, cars, music and clothing all echo the period. As time passes, hot rod cars, 50s fashion and some of the eraâs best music reflect the birth of a cool new era. Illusion EngineTM: 2K Czechâs proprietary Illusion Engine, allows gamers to explore Empire Bayâs 10 square miles of beautifully rendered outdoor environments and intricately designed interiors. Soundtrack Reflects the Mood of the Era: Players will be immersed in the Golden Era of America as Mafia II features tracks from some of the eraâs most influential artists.